You Can't Prove a Negative - Fact or Myth? One can’t prove a negative. The saying “you can’t prove a negative” isn’t accurate. Proving negatives is a foundational aspect of logic (ex. the law of contradiction). To “prove” a something we simply have to provide sufficient evidence that a proposition (statement or claim) is true. In other words, we have to show that it is very likely the case, we don’t have to show it is true with absolute certainty. Thus, to prove a negative, we only have to show that it is very likely the case. To do this, there must not be compelling evidence that it is the case and there must instead be compelling evidence that it is not the case. We DO NOT have to observe empirically that which cannot be observed (for example, we don’t have to see a Unicorn not existing to know it doesn’t exist, we just have to show compelling evidence of its non-existence). Thus, proving a negative in this sense can be accomplished by providing evidence of absence (not argument from ignorance, but scientific evidence of absence gathered from scientific research). For example, a strong argument that proves that it is very likely Unicorns don’t exist involves showing that there is no evidence of Unicorns existing (no fossils, no eye witness accounts, no hoofprints, nothing). At that point, the burden of proof would be on those who believe in Unicorns to prove that Unicorns do in fact exist (the burden would be on them to prove the theory of non-existent Unicorns false by providing a better theory). This is just one of many ways to prove a negative, below we list others including using the law of contradiction and using double negatives. Is the popular “you can’t prove it doesn’t exist” a good argument? Does this prove God does or doesn’t exist? Proving the existence of God (or the non-existence) is loosely related to this line of reasoning, but it is sort of outside of the sphere of what we are talking about here. If one claims, “all that is is, but God exists outside of that” then the argument for God becomes ontological, theological, metaphysic, and faith-based. Faith-based metaphysical arguments don’t require scientific empirical evidence… unless they try to posit something that can be debunked by empirical science (in that case, arguments for faith instead of reason tend to be logically “weak,” in that they lack supporting evidence). To clarify the above, in terms of proving negatives with certainty and uncertainty, we can prove some negatives with certainty (like necessary logical truths such as “A is not B” and double negatives like “I don’t not not exist”), but generally “proving negatives” means providing compelling evidence that shows it is very likely that something isn’t the case (it means “proving” probable truths, not certain ones). This type of “inductive” reasoning can produce scientific truths using evidence of absence (it can show that it is likely that something isn’t the case via scientific observation and measurement that shows a lack of evidence), but the reality is there isn’t much we can actually prove true or false for certain (negative or positive) using evidence or a lack-there-of. The Law of Contradiction itself is a negative: “Nothing can be A and not A.” Ex. Ted can’t be in Room A and not in Room A (and therefore, if Ted is in Room A, then Ted is not in Room B; or if Ted is in Room A, then Ted is not not in Room A). This is a rule used in deductive reasoning and is a necessarily true logical rule. The Modus Tollens also proves a negatives: “If P, then Q. Not Q. Therefore, not P.” Ex. “If the cake is made with sugar, then the cake is sweet. The cake is not sweet. Therefore, the cake is not made with sugar.” This is also a logical rule that relates to deductive reasoning. Proving a negative with certainty using double negatives: Any true positive statement can be made negative and proved that way. Ex. I do not not exist; or Every A is A, nothing can be A and not A, everything is either A or not A, therefore A is not not A. These prove a negative with certainty, but are somewhat redundant (rephrasing “A is A” as “A is not not A” is tautological). Proving a negative with probability using induction: We can show something is highly certain using evidence of absence, but we can’t know for sure (that said, the same is true for proving positives with evidence; this is the nature of induction). Ex. Santa cannot be real and not real at the same time. There is no evidence to suggest Santa is real. Therefore it is highly likely Santa is not real. Simply put, induction doesn’t prove negatives with certainty; but it can produce highly certain scientific and logical conclusions. TIP: Learn about how induction and deduction work. The certain proofs are deductive, the likely proofs are inductive. The Absence of Evidence and the Evidence of Absence – What Do People Mean When they Say “You Can’t Prove a Negative”? In general, and putting aside those who misunderstand the concept, when people use the phrase “you can’t prove a negative” they mean: we can’t prove negatives with certainty based on the absence of evidence alone (the absence of evidence is not necessarily the evidence of absence). For example, having no proof of Bigfoot doesn’t prove that he isn’t real with certainty. Likewise, it is hard to provide proof that a giant flying invisible unicorn name Terry-corn doesn’t exist… because there is no evidence of such a thing and thus our best evidence is an absolute lack of evidence. We can only “prove” that which there is no evidence for with a high degrees of probability (by considering the lack of evidence and some rules of logic). With that in mind, and as noted above, we can’t actually prove positives very well either. Most proofs (positive or negative) rely on inductive evidence, and induction necessarily always produces probable conclusions. In other words, if we had Santa on tape admitting he was Santa it would still only be very strong evidence (it wouldn’t prove he Santa was real with certainty; our senses could be tricking us, the video could be fake, we might be in the Matrix, etc). We can actually prove some negatives with certainty (using deduction), and generally speaking this type of proof is a foundational aspect of logic. “The Absence of Evidence is not the Evidence of Absence”… although it is often a really, really, strong hint (the same works for correlation and causation). In other words, a lack of evidence is a sort of evidence, but it doesn’t prove anything with certainty. If we know Ted must be in Room A or Room B, and we have always seen Ted in Room A, and Ted never has gone into Room B and doesn’t have a key to Room B, and no person in the history of humankind has ever provided evidence of Ted being in Room B, we can be very confident in a logical inductive argument that concludes with a very high degree of certainty that Ted is in Room A. In these ways, “we can prove a negative… just not with certainty in some cases” (although, again, we can’t prove much with certainty outside of “tautological and analytic statements a priori” anyway). TIP: For more reading, see: “You Can Prove a Negative ” Steven D. Hales Think Vol. 10, Summer 2005 pp. 109-112. James Randi Lecture @ Caltech – Cant Prove a Negative. Skepticism is very useful, here is a good discussion on the ways in which we should understand the truth behind the “you can’t prove a negative” idea. 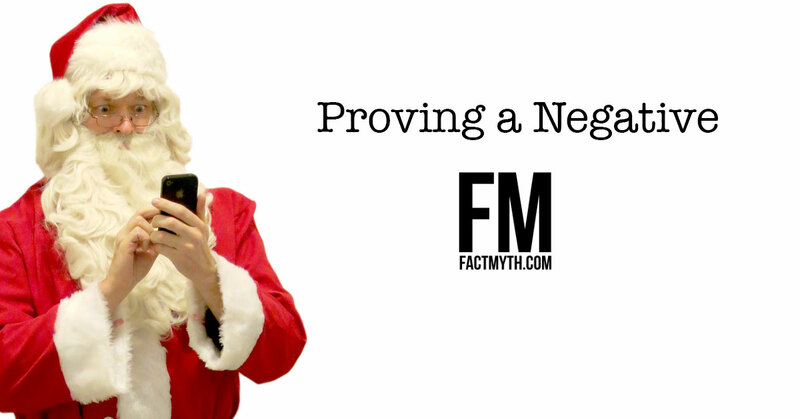 What Does Proving a Negative Mean? With the above introduction covered, let’s start at the beginning again and cover some details. Now that we know the task and have the basics down, let’s discuss how to prove a negative and the ways in which we can and can’t prove negatives. The law of contradiction / non-contradiction states that a proposition (statement) cannot be both true and not true (that nothing can be both true and false). …in other words, one of the fundamental laws of logic (the laws of thought featured below) is a provable negative proposition (and is thus an example of proving a negative). To help that sink in, here are the laws of thought. The Law of Identity: Whatever is, is; or, in a more precise form, Every A is A. Ex. Whatever is true about Santa is true about Santa. The Law of Contradiction: Nothing can both be and not be; Nothing can be A and not A. Ex. Santa cannot be real and not real at the same time. The Law of Excluded Middle: Everything must either be or not be; Everything is either A or not A. Ex. Santa must be real or not real. If Santa was real there would likely be some evidence of Santa (not certain). There is no evidence of Santa (we should assume this as certain for the example). Therefore we can reasonably infer that Santa is not real (a likely truth inferred using induction). Now, to be fair, that is an inductive argument (a very strong and cogent one, but an inductive argument none-the-less). What that means is that we didn’t produce a certainty, we produced a probability. … with that in mind, almost all arguments are inductive and therefore probable. If we find a person hovering over a dead body with the murder weapon and they say “I did it” we still don’t know for sure that they did it. If we find zero proof of Santa ever, we still don’t know for sure he doesn’t exist. However, in both cases we can be very certain of our conclusions, and we can prove our conclusions using logic. If to prove something is to prove absolute certainty, then only tautological forms of deduction are valid and induction (and all other reasoning methods are useless). <— This creates a very strange and existential world where we can’t trust our senses and theories are meaningless. If we on the other hand can consider overwhelming evidence that draws a highly certain conclusion as proof until better evidence comes along, then we can prove negatives. <— This is how science works. With all that said, details aside, the blanket statement “we can’t prove a negative” is wrong either way. In mathematics and logic, when we replace empirical evidence for numbers and symbols, we can prove negatives all day. Of course, even in the way it is meant, that lack of evidence doesn’t imply lack of existence, even that isn’t exactly right. No one ever in the history of mankind having evidence of Santa is itself… pretty strong evidence. “You can’t prove a negative” #logic. To summarize the above, when we have zero evidence of something, the absence of evidence itself is not the evidence of absence. However, proper scientific evidence of absence can be a fairly strong hint in terms of inductive reasoning (all that non-evidence is a big hint). The Law of Contradiction proves a negative with certainty: Nothing can both be and not be; Nothing can be A and not A. We Can Use Inductive Reasoning to Provide a Likely Proof as Well: We can show evidence of absence as proof of likelihood. We Can Also use Double Negation: Simply converting a positive statement into a double negative. We can generally use a mix of all the above. TIP: We can prove A is not B by noting that every A is A, nothing can be A and not A, and everything is either A or not A. Therefore B is not A. We proved that B is not A, we proved a negative. Details aside, the blanket statement “we can’t prove a negative” is not correct. It is true that the absence of evidence isn’t fodder for certain proofs in most instances… but like, evidence isn’t fodder for certain proofs in most instances either. That is the nature of induction. Simply, evidence of something and evidence of the absence of something are both valid forms of supporting evidence for logical arguments. In every way we can prove something is the case, we can essentially prove something is not the case as well. THE OLD PSEUDOLOGICAL STATEMENT “I CAN’T PROVE A NEGATIVE” has been used mostly by those who have a hard time dealing with truths that they either can’t handle or don’t want to. In this current age and post truth climate of “fake news” and fact manipulation this fallacious statement is used by a lot of media people and reporters when truth thirsty people aren’t letting them do their jobs the way they want. I like this essay so much I posted it on Facebook. Glad to hear the feedback. Thank you for sharing it! This is a poor example. Invisible pink (or any other color) anything’s, are easy to disprove. Pink is a frequency in the electromagnetic spectrum. If something is invisible, by definition it is not reflecting any frequency at all. If it’s pink, it’s frequency is being reflected and it cannot be invisible. For this old argument to work, you have to posit some mechanism which is impeding the reflection of the color from the view of some observer. But that doesn’t make the unicorn invisible in itself. That only adds a factor that hides it from light-dependent vision systems like human eyes. It may seem like quibbling but it’s important. This is wrong. That claim that God exists outside of nature – all ELSE that exists is a logical conclusion, not a faith-based claim. By definition, God created ALL ELSE that exists and therefore he NECESSARILY exists “outside”, “beyond”, or transcendent to it. a) Your entire article is based on metaphysics. Logic and reason are metaphysical! b) You have an incorrect idea of what proper faith is. Faith is trust. Trust must be based on evidence of trustworthiness. And that is of course, the very kind of faith promoted in Christianity for example. Nowhere are people demanded to just blindly believe without reason, in the bible. On the contrary, we are told, “Come let us reason together” – by God. We are also told that Christ left his followers “many infallible proofs” of his resurrection. He had no such stupid idea of faith that they ought to just believe it without evidence. Your view in this looks like the ubiquitous error made by atheists everywhere concerning the meaning of faith as some sort of blind, irrational leap in the dark. That is not real faith. That is stupidity. That blind kind of “faith’ can exist, of course. But that kind is foolishness. Anything that can be debunked by empirical or other forms of evidence cannot be logically weak. Lacking supporting evidence does equate to “weak”. An argument may be air-tight logically, yet without any empirical evidence. The proof of God, for example, is logical, not empirical. Unless one denies the validity of logic, that proof, if well reasoned, is as good as any other. Else we ought to abandon mathematics which is based on logic. Moreover, you seem to be neglecting the fact that you cannot trust your own faculties of reason without having some good evidence that they are presenting the real world, correct logic etc. You cannot test your brain using your brain. So how do we know that our own faculties of reason are trustworthy? Under a purely materialist view, we do not and cannot. The reliability of reason itself must be taken as an article of faith. An axiom of reason, if you will. Else nothing is knowable at all. We may well all be nothing but clumps of cells in a Matrix, being fed illusory images and sensations of some algorithmic origin, in such a case. The idea that we are all mere bags of chemicals, sacks of meat, packs of neurons, destroys any possibility of objective reasoning being known to be reliable. It destroys objective rationality. Thanks for the thoughtful response. I’ll think on it. If all we know for sure is that we know nothing for sure, how can we be sure we know nothing for sure? I’m sure I do not know…. or am I? You cannot prove that something does not exist. “There is no God.” Show me proof. You cannot, logically, prove a negative. A reductio ad absurdum example is “Prove that Thomas DiMichele is not a murderer.” Unless you can produce incontrovertible evidence that Mr DiMichele has not ever, at any nanosecond of his life committed homicide, you cannot prove that statement. Another: “No one goes there anymore.” First, the lack of time frame is obvious. Second, the only way to prove that is to go there to observe, which then disproves that statement. Best: “You can’t prove a negative” is not a fact. While i can expound on my examples of a scientific proof into a proof of it’s own, I cannot say there is NOT evidence showing it is NOT a fact. Lack of positive evidence is not the same as disproving it. A preponderance of evidence is NOT proof. It is simply an argument to support the general validity of a statement.